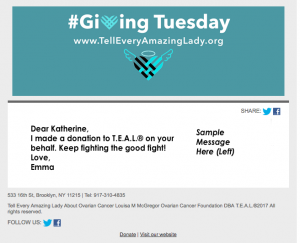 Tell Every Amazing Lady® is honored to be a charity partner in the 2019 TSC New York City Marathon. Join T.E.A.L.® for the 2019 TCS New York City Marathon and conquer the Concrete Jungle for an amazing cause. Run with over 50,000 participants on this iconic 26.2-mile course throughout the 5 boroughs of New York City. The November 3rd event will begin in Staten Island where runners will then make their way over the Verrazano Bridge, into Brooklyn followed by Queens and the Bronx, and then finish in the world-renowned Central Park. Complete with spectacular skylines, and an unparalleled view of NYC’s most popular landmarks, this is one race you definitely don’t want to miss. If interested in joining team Tell Every Amazing Lady® please fill out the interest form below. Filling out the form does not guarantee entry into the 2019 TCS New York City Marathon. T.E.A.L.® will evaluate all entries and reach out to the selected official runners by end of March 2019. Discounted 5K run entry to the 11th Annual T.E.A.L.® Walk/Run on September 7, 2019! Any questions? Please feel free to reach out to alyssa@tealwalk.org.